Let me start by saying that I have been a chronic gum chewer since about the 8th grade. I’m talking 3-4 packs (yes whole packs) of gum A WEEK! EEK! Do I even know what’s in gum? Of course I do! Fake sugars, some natural sweeteners/flavor, softeners, flavorings, and some other things. However, xylitol may help reduce cavities and plaque build up, plus who doesn’t love fresh minty breath post meal? Anyways, being someone who tries to be healthy via my eating habits and exercise, my gum habit likely ruins that reputation a bit. I try not to consume processed foods or foods loaded with ingredients I cannot pronounce. And being an RD and cross fitter, I am very health conscious! So why shouldn’t I also care about what’s in my gum? That’s where Train Gum comes in! 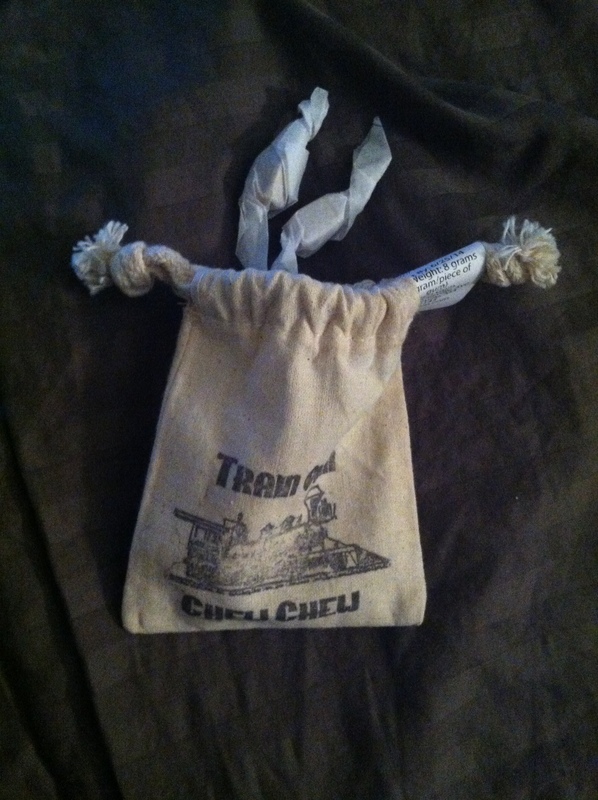 I started following Train Gum on twitter and was delighted to read on their website that their gum only contains 5 ingredients: chicle, sugar, natural oils, stevia, and rice flour. When they offered me a sample, I didn’t hesitate to say yes, recognizing that this could be a health conscious alternative to all of the artificial chewing gums I consume. Sam Singer founded Train Gum in 2012 with the idea that many athletes are health conscious and gum has been shown to potentially increase reaction times. But most importantly, he realized that even something so basic as gum should have ingredients that you can pronounce and that you can feel good about. Train gum was born! The gum company went back to the original gum roots using chicle from the sap of the sapodilla tree. Chicle, while it won’t last as long as regular gum when it comes to chewing, is all natural and used to be the base for all chewing gum until synthetic gums bases were developed. As far as caloric intake, sugar is the only one of the 5 ingredients with any calories. The use of sugar is mostly for consistency purposes and not for sweetening purposes, so in each piece of gum, there are 0.05 teaspoons of sugar or 0.8 calories per piece. Thus far this is the only gum, next to Glee Gum, that I have come across making a commitment to use all natural ingredients. Plus I just love the packaging it comes in! I felt like with each piece I was opening up a tiny present. It also comes in muslin bio-degradable bags. The gum has kind of a cinnamon taste to it even though no cinnamon was used and has a unique flavor to it with somewhat of a bitter aftertaste. But overall, the gum was pretty impressive and Train Gum hopes to put out lemon and raspberry flavors soon too in addition to their current peppermint and grapefruit flavors. Not located near one of these places? No worries! You can also order online and each bag will include 8 pieces of individually wrapped gum. I hit unsubscribe by accident! Can u add me back?! I don’t believe I have access to that function but simply resubscribe or will it not let you?